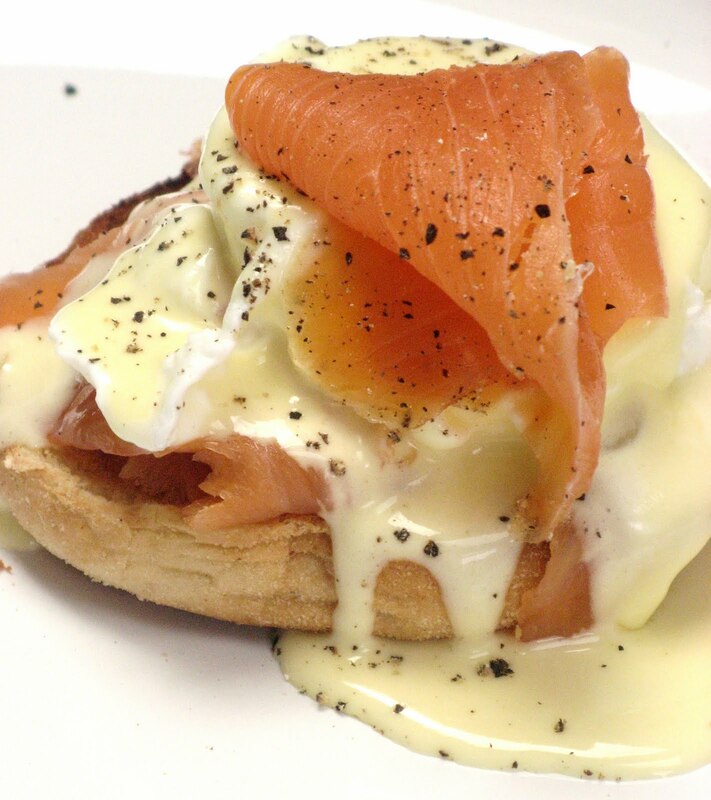 Eggs Benedict has got to be one of the ultimate breakfasts one could ever encounter. The delicate crunch of an all butter English muffin with the runny smoothness of a perfectly cooked (if not beautifully presented) poached egg topped with the bite of home-made Hollandaise Sauce. I began this love with eggs Benedict years and years ago on holiday, on my Gap Yaaaaaar actually, in Australia. If there is one thing that the Aussies can do – it’s Breakfast! Until then, going out for breakfast had consisted of ’Full English (no mushrooms though, thank you so much)’ or a tres tres rapide croissant et cafe noir. Never had I sat and enjoyed the rich, creamy calorific joy that is Eggs Benedict. These days I have to limit myself because, let’s face it – the 150ml of melted butter that goes into enough Hollandaise for 3 people is a weeny bit unhealthy! And you can’t say ‘why do you have less sauce?’ to a Northerner like me – it just doesn’t work! • Put the white wine vinegar into a microwave proof dish/jug with the peppercorns and tarragon. Microwave for 10 minutes. During that time the vinegar will reduce and will also absorb some tarragon and pepper flavours. • Melt the butter – all the chefs say do it in a saucepan and skim off the froth – I say, use the microwave (again) all the fat will sink to the bottom and just be sure to only pour the clear stuff when you’re using it. • Have a pan of boiling water with a heatproof bowl over it ready, I have a plastic jug with a handle that I used and it worked a treat. • Egg yolks and 2 tbsp the white wine vinegar mixture into the jug/bowl. Using electric whisks beat them together until very pale yellow and frothy. • Add about a tablespoon’s worth of the melted butter to the pale yellow froth and whisk until it’s fully combined with the froth. • Continue to add the butter in a very slowly drizzle keeping the whisk switched on while drizzling. If you do this from a jug the white grubby bit at the bottom will stay there and you’ll only get the clear stuff. • Once you’ve got towards the end of the jug of butter, have a taste of the sauce (switch the whisk off first obviously – SAFETY FIRST). It should look yellowy creamy in colour and look like runny mayonnaise. • If, when you taste it, it takes the skin off the back of your throat then add more butter. If all you can taste is butter then add a little lemon juice and a drop more of white wine vinegar. Getting the right flavour is about trial and error. If you add more of anything make sure that the whisks are on and ensuring everything is blended through. 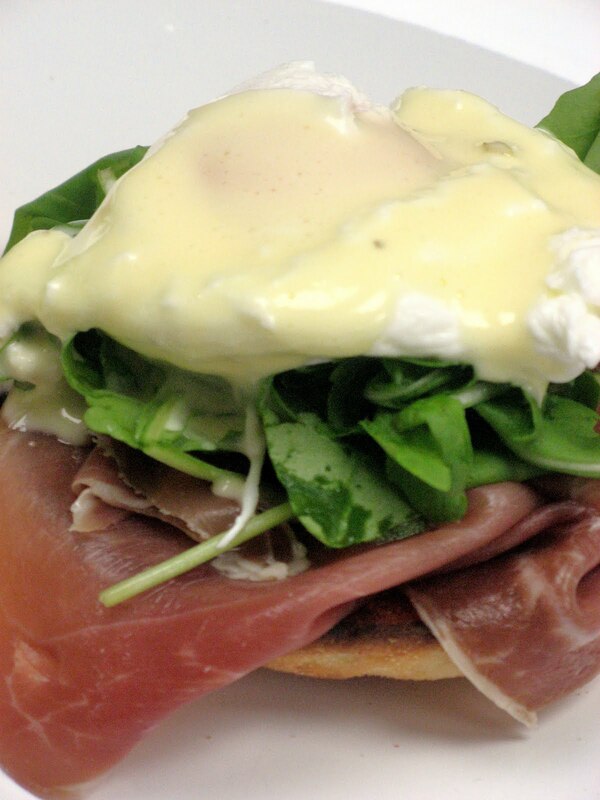 • Put the egg on top, pour the Hollandaise over the top. yummmmmmmy….. You can make me breakfast anytime.. Sounds delicious. What happens if you pour in the gloopy stuff from the butter? The stuff at the bottom. Does it all go horribly wrong? The gloopy stuff (milk solids and any other gunk that has been added to the butter)has quite a bitter taste and will tarnish the smooth taste of the sauce, it may also lead it to curdle. A drop or two fo the stuff won't be a crisis but we just want the clear stuff (butter fat).If you melt it in a jug in the microwave the clear stuff will be at the top and if you just pour slowly the gloop won't come out. Treat it as if you were decanting a bottle of wine that has sediment in the bottom…Hope that helps….